Krunner is exactly like that lovely, lovely 80s futuristic Dystopian sci-fi movie with Arnold and Jesse, except that is different in every single way. Now, for those of you who’ve fiddled with KDE before, possibly on a roof, hihi, then Krunner is not a stranger. It’s a familiar and useful application available in the desktop framework set of default tools. Only now we have Plasma at our disposal, and we need to give it a fresh new try. This is also a good opportunity to expose any problems and bugs that may exist, as Plasma is still being shaped and molded, developed and tweaked, improved and bettered. With some tough love from readers and reviewers, it will only get more successful. Today, we will play with Krunner, and see its awesome powers. Indeed, Plasma is becoming my favorite desktop, and this is another great opportunity to gloat and fanboyize. So what do you do with this fine beast called Krunner? First, you invoke it. This is done by using a key combo, or from the system menu. But using Alt + Space sounds fancier. Then, you start doing pretty much anything you can think of. You can play music from Krunner. 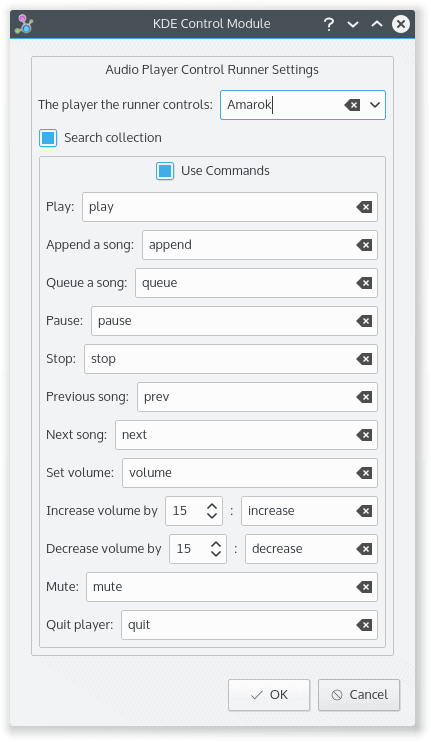 Invoke programs, play songs by specifying their path, or even use special commands to control Amarok or other media players. This will probably appeal to power users more than an average person, but wait, we’re just getting started. If you’re into geeky stuff, then there’s nothing as cool as shell commands. Indeed, Krunner can execute shell commands. This means you don’t need to invoke Konsole directly, and you can do whatever you want from a single, unified interface. For example, you can play all media files of a certain format. But then, you have dedicated commands for that. Start a program, they say. Kill a program, they say. Both options are available. When it comes to killing processes, you can specify signals, and of course, you have the whole repertoire of shell commands at the tip of your fingers. If you’re really lazy, and you don’t feel like starting a browser on your own, you can access web pages through Krunner. Eventually, you should see the page loaded in the default browser. This functionality does not work in Vivid beta, but it does work in the recently, freshly released Netrunner 15 Prometheus. Lovely jubbly. Is this the whole list? Hardly. Krunner can also interact with the desktop, like switch between virtual desktops, start a new session, send emails, search through contacts in Kopete, check date and time in multiple timezones, access Marble bookmarks, change system settings, and still more. In general, most of the stuff should work. But some of it’s still not yet ready. For example, I was not able to do any fancy mathematical calculations, which should be included in any desktop assistance software. The basic stuff works. Indeed, compare this to Cortana. And with the right kind of API, I see no reason why powerful computational knowledge engines like Wolfram-Alpha might not be used. For most other plugins, you have a fair degree of freedom in configuring the options to your liking. You can setup the magic word used for spell checking and thesaurus, or maybe use special commands to control the media player of choice. 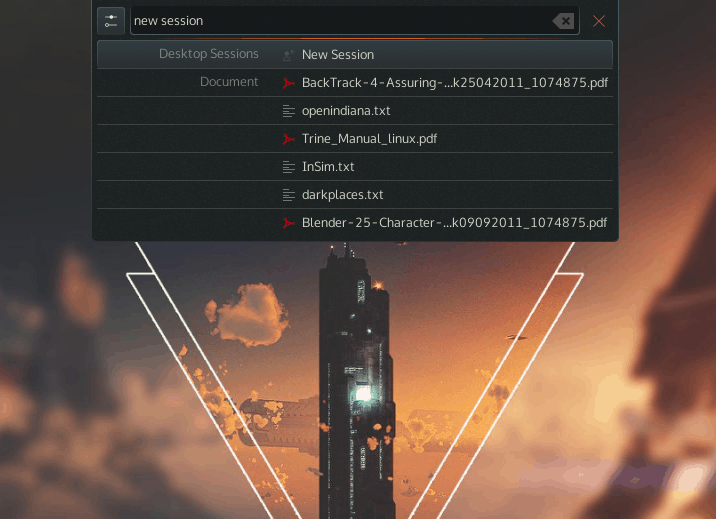 The default program is indeed Amarok, and you have a bunch of cool commands at your disposal. 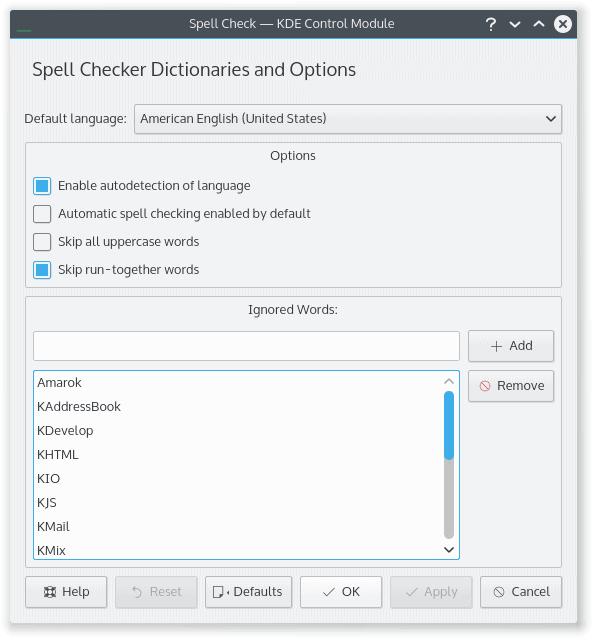 For the spellchecker, you can also enable the module to autodetect languages, automatically check words written into the Krunner text field, ignore special words like the names of programs used by Plasma, and more. This is quite handy. I may have hinted just earlier that some of the stuff is broken. This is indeed the case. 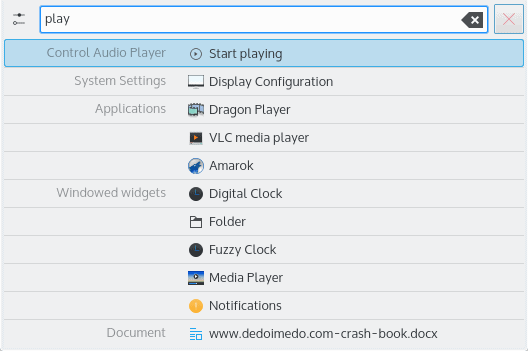 On KDE, Krunner currently has more features and options, and it’s also more configurable. This will have to be resolved by the time Plasma 5 becomes mainstream, because otherwise, Krunner will become neglected and unused, and that would be a shame. So what can be done to make Krunner into a stellar product? I believe that additional online integration should be considered, similar to what Ubuntu tries to do with its Launcher and scopes. Of course, this needs to be voluntary, opt in and such. Privacy and alike. The functionality also must be intelligent and non-intrusive. Just read my Windows 10 review, and all the Cortana/search examples to get a feeling of how you shouldn’t be doing this. The basic idea is brilliant, but it is muddied by a wrong attempt to wed the desktop with the cloud. That does not mean we should shun the cloud, as a technology and concept. But there must be a very delicate way online searches and calculations are introduced to the desktop, without harming the flow and harmony of everyday use. But also imagine the possibilities. If someone is inclined to use Krunner for literally everything, then a shopping plugin would do most nicely. And the same goes for books, weather, travel, social networks and sharing, and more. But you all know how slippery the slope of this benign and hopeful attempt really is. One moment, you try to help people, and the next, they curse you for invading on their private lives and for pushing useless stuff down their throats. The same could, and probably will happen, if and when Plasma goes live, so to speak. Again, the possibility should not be discarded. It must be considered. And since Plasma 5 seems to be the most sensible desktop around, then I believe its developers will have the right insight to make Krunner and online integration just as sensible and smart. Krunner should also be used for updates, as well as software and games purchases. Krunner can really be useful for people that want to stream movies and music, and many other cool things. The question is, where do you stop, because it can soon outgrow the desktop itself, gain intelligence and self-awareness, and then we’re fighting machines. To sum it up, I believe Plasma 5 devs should take a bold step forward and begin a careful experiment with how clever and intrusive Krunner can really be without destroying the spirit of the desktop or dumbing down the users. With some patient work, it might just be possible to derive the golden formula that makes this desktop environment the future of computing. It could combine everything. Convenience, financial gain, ease of use, privacy. And that would make it the killer app of the Linux world. Once and for all. Krunner is a hidden gem of the KDE and Plasma framework. True, all of what you see here has been around for many years. However, with the birth of Plasma 5, this little assistants gets a new meaning and importance, and it has the potential to revolutionize Linux. It can be what it is, a program that indexes stuff, does some intelligent calculations, suggests a few useful things, and allows you to control your desktop and programs. Or it could be much more. With extra plugins, and some careful online focus, Krunner could become the most useful piece of the Plasma framework. Best yet, it can learn from the mistakes implemented in Unity, and then work around them. Given the sensibility I’ve witnessed in Plasma so far, there’s a good chance this could happen in a way that exceeds similar attempts, be it Linux, Windows or anything else. How about that? Anyhow, you have a new toy, so start playing. My fanboy rant is done for today. Very nice review. I had no idea about the potential of KRunner, indeed much more than a simple app launcher. With this transition, plasma 5 is quickly becoming the competitive desktop we needed for Linux, bringing innovation without sacrificing everything else. Definitely is becoming the next generation desktop that I’m willing to jump into from my beloved XFCE. Well, it’s really hard not to look at Plasma 5. Even as a big fan of Gnome. At the moment I am switching between Plasma 5 and Gnome. The decision will be difficult. Anyway it’s great to see that Plasma is developing this way. Seriously, the Gnome overview has a calculator feature now, but I wish it did more, like unit conversion. Krunner is great, i just wish it had Unity HUD functionality for searching menus. There is a appmenu plugin for KRunner for Plasma 4. 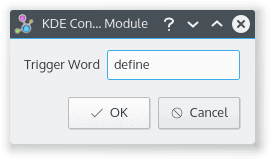 But then appmenu d-bus spec was deprecated when Gnome and Canonical switched to GMenuModel. Though, it should work with Qt4 apps under Plasma 4. @aiphee:disqus Have you tried this? Krunner is pretty handy really. I most frequently use it to toss in quick shell commands and start programs when there’s nothing to alt+tab to. I’ve been using krunner as my main launcher for years now. On problem with the plasma 5 version is that it doesn’t seem to have history, so it’s impossible to press up and search through previous commands. Or maybe these are just my broken settings? Didn’t know about previous command navigation, thanks for that! I too have been using KRunner as my main app launcher for years and I don’t miss having a menu whatsoever. Having the same issue. As far as I’m concerned plasma5 is junk. Bunch of designers thinking about presentation and not about functionality. System tray notification for older apps is also gone. I’m switching my workstation to Centos 7. At least I will have a few more years with kde4. Hopefully in that time they will fix everything they broke. Why do we have to go truthis every time a new major version is released. 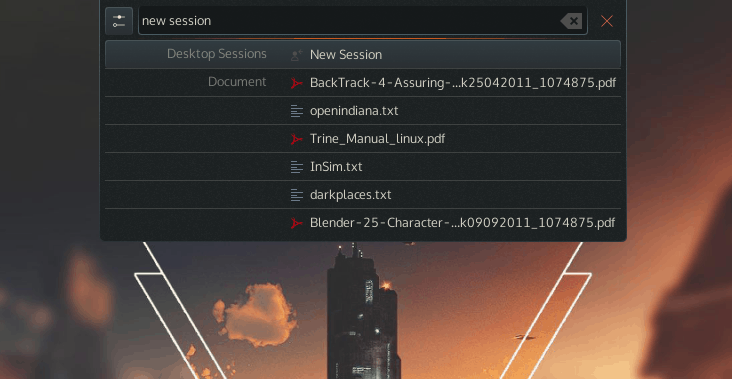 Now that it is May of 2016, krunner does have history, but it turns out that it uses a different file than the one it used under KDE4 (not unreasonable since the old file has “.kde4” in the name). I’m wondering if the legacy file can be copied into the new location – i.e. are all the old categories and settings still valid or have they changed. It seems as though they have changed based on the fact that the KDE4 tool used “[General]PastQueries” and “[PlasmaRunnerManager]LaunchCounts” to maintain history and the new tool (based on the only thing I see in the file) appears to use “[General]history”.